Monopoly gives many the wrong impression of business and capitalism. Monopoly was originally intended as an educational tool to illustrate the negative aspects of monopolies. I love the Parker Brothers* game Monopoly. My mother taught me to play Monopoly when I was about seven years old. It didn’t take long for me to get pretty savvy, and I soon became an accomplished player. We played a lot in those days, especially when we went on vacation. Many times, adults and children would play together. For a seven-year-old, playing Monopoly with adults was a real rush. It elevated you to the same power level as the adults. You could buy, sell, negotiate, and collect rent, just like the adults. Sometimes, you would buy a property that another adult wanted. That put you in a real position of power. For a kid, Monopoly was a great equalizer. But even at that age, I could sense there was something wrong with the way Monopoly represented business. For a player to win, everyone else had to lose. There was a disconnect between what I saw planing monopoly and what I saw in the world around me. People weren’t losing because some were winning. As I grew older this question vexed me. It wasn’t until I began to study economics that my thinking on the subject became clear. For many people, playing Monopoly is their only experience with buying property and collecting rent. After playing the game, many people seriously believe that for someone to profit, someone has to lose and businesses win by “bankrupting” others. Nothing could be farther from the truth. 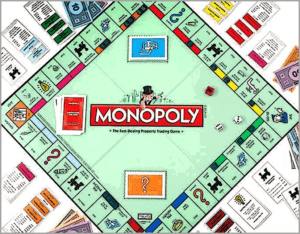 Ironically, the game was originally invented in 1903 as a game meant to promote the free market by educating people on the negative effects of Monopolies. While many people have played Monopoly, few have considered its origin, nor are they aware that Monopoly was never meant to represent free market economics for the following reasons. Business transactions in the free market are always a win-win proposition. If you want to stay at a hotel, you’re free to choose which hotel, and which rate you’re willing to pay. You’re never forced to stay on “Boardwalk” if you can only afford “Baltic.” This fact alone is the game’s biggest flaw and has done more to contribute to capitalism’s bad rap with liberal-minded people than any other facet. Furthermore, in a free market transaction, you always get at least as much value as you give; otherwise, you wouldn’t make the transaction in the first place. If you “Ride the Reading” for example, you get where you’re going, that has value or you wouldn’t buy a ticket. In the free market, resources are unlimited. In Monopoly, when all the property has been purchased, resources are fixed. You must either go without or buy property from fellow players. You can’t, for example, say, screw it, I’m going to write a software program that makes the banker’s job easier and charge him for that. In the free market, resources are virtually unlimited as the human mind can turn seemingly worthless matter into valuable assets (think sand into silicon, or bits into software). Don’t confuse the word “capitalism” (private ownership of the means of production) with “free market capitalism”. It’s quite possible to have “crony capitalism” (better known as fascism) in a controlled economy. In Mussolini’s Italy or Hitler’s Germany, capital could be privately owned, but you may be required to “Advance to Boardwalk” if the state said so – no questions asked. Capitalism only works in conjunction with free markets and the “rule of law.” Individuals must be free to choose which transactions they wish to enter into, and must also be held responsible for those decisions – for the better or worse (no government intervention, bailouts, stimulus, subsidies, protective tariffs, or other laws restricting entry into markets, competition, etc.). Most importantly, in a truly free market, a “monopoly” is a very good thing. This situation, however, almost never occurs. The only way to create a monopoly (single source supplier) is to be so much better than any of your competitors, that no one dares compete with you. The consumers win because the supplier is offering a product that serves all their needs so completely, that they have no desire to look for an alternative. Sadly, however, monopolies almost always exist because of government force. Governments pass laws restricting competition thereby creating monopolies (think the gas or water company). Negotiating skills – I love watching my kids learn how to become strong negotiators. After a few games, they quickly learn the value of property, position, cash, probability, and other factors that contribute to a winning position. I would put my ten-year-old up against any Wall Street banker in a “by the rules” game of Monopoly. Gamesmanship – Politics is a huge part of Monopoly. Just as in life, fear and intimidation cause people to make unlikely deals. Developing political astuteness is a valuable asset in any negotiating situation. Sportsmanship – In life, you lose many times more than you win. learning to lose with dignity is key in developing character. Teaching children to “feel good” about other’s good fortune develops character. Ultimately, Monopoly is about exchanging worthless paper. The only thing at stake is your ego. It always amazes me how “invested” many people become in protecting their self-image. By teaching children that “your assets are not you,” you impart the most valuable lesson in life – you’re value is not determined by what you own, but rather, by how you play the game. Play hard, wish others well, and have fun. Play by the rules – If played by the printed rules, monopoly usually lasts no longer than 90 minutes. As a veteran of hundreds of games, I can tell you that most people don’t adhere to the published rules. Instead, many implement what I call “folk rules” that prolong the game unnecessarily. For example, there is no rule that says you get anything for landing on Free Parking. Yet, how many people put money in the middle of the board and reward it to the person that lands on Free Parking? This process perverts the economy of the game by inflating the currency. Any veteran player knows that cash management is critical in Monopoly. Another rule that is routinely ignored is that players can make deals and negotiate at “any time,” even during other players turns. This rule shortens the game tremendously. Monopoly is not free market capitalism – Most importantly, teach your children that monopolies almost never exist in the free market. Business transactions are always value for an equal value proposition. In a free market, no one forces you to “Advance to Boardwalk”. It’s always a free choice to stay at the best place in town.